As you might have noticed, I am proud to be part of the Philips Avent Ambassador program, and I have one final product to tell you all about. It's the Philips Avent Penguin Sippy Cup. We just love this cup. From a mommy standpoint, I love the simplicity of this cup. As you can see in the picture, this cup is literally 3 pieces: the soft spout, the lid, which includes the handles and the body. Secondly, we love the handles. These handles are designed to be easy to hold on to and even have grips that make it easier for them to hang on to. The princess is now seven months old, so we are just starting to get her adjusted to sippy cups making the transition easier when we take her off of bottles when she is a year old. The soft spout of this cup will make that transition incredibly easy, because she is already taking to it like a champ! It also helps that this sippy cup has an angled spout so the princess does not have to tip her head really far back to get a drink. This has a cap included as well so it is hygienic and you can just toss it in your bag and go! Mommies know how important it is to keep germs away from out little ones! Of course this cup is dishwasher safe and BPA free, because Avent is in the business of keeping babies safe, and making moms lives easier! 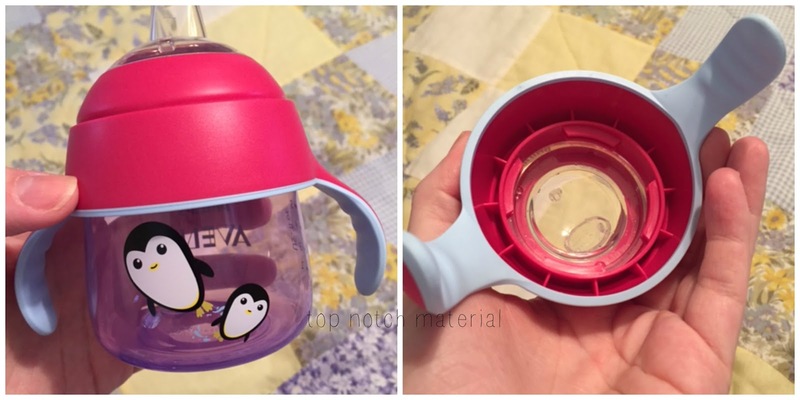 Also this cup is compatible with the Avent bottles and other cups (with a couple exceptions) so once again, you an change all of these out with one another. If you need a larger sippy later on, you can add the bottle base and tada..... a 8 ounce sippy cup. Convenience is what Avent is all about! Also, lets talk design. Isn't this just the cutest little cup? Penguins are precious, just like our babies. The pack of two sippies are priced at a very nice price of $5.99 too, so they do not hit the pocketbook to hard either! ambassadorship. 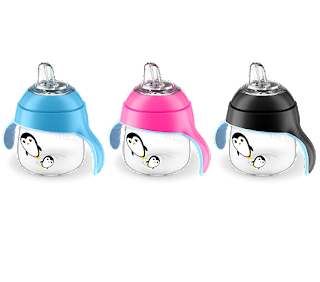 If you know someone that is expecting, buy her the Philips Avent Double Electric Breast Pump or some Avent bottles to get her started on the right track! This post was sponsored by Philips Avent and financial compensation was received for this post. This giveaway is not hosted by Top Notch Material and winner will be chosen by Phillips Avent and contact by them. The sponsor and any compensation received for this post in no way affected my opinion or any statements presented in this post. Top Notch Material blog always provides honest opinions, and honest beliefs or experiences on products and services reviewed. If you have any questions or would like your product, service or company featured on Top Notch Material, please contact Paige from Top Notch Material at nursemommypaige at yahoo dot com The disclosure is done in accordance with the Federal Trade Commission 10 CFR, Part 255 Guides Concerning the use of Endorsements and Testimonials in Advertising. I have 2 little girls that I watch while my children are at home so I would keep these in my house t use with the girls.